WOW this has been an extremely warm summer. The sun is getting hotter also, according to scientists, and that means our skin is being damaged and aging faster. The best way to repair and prevent that is using Pevonia’s Vitamin C Complex. I have been using this product for years, especially on the golf course and my grandchildren’s baseball games, and it’s really protected my skin. Sunscreen does not agree with my skin, so have never used it. My routine before going out into the sun is: Vitamin C serum, cream over it, and an antioxidant internally. Using C during the day, prevents sun damage and using it at night repairs sun damage. Night time is the time for repair of the whole body, skin included. You need to know that vitamin c is not a stable ingredient unless it is manufactured properly. Not all C serums are effective for that reason. Pevonia’s Vitamin C Complex is effective and safe for your skin. I have been using it for years. with great results. With my wellness facial treatments using vitamin C, your summer sun damage can be reduced so you have younger, healthier looking skin. Check out special on Vitamin C Complex under special offers. Today we’d like to introduce you to Joan Kesman. Joan, let’s start with your story. We’d love to hear how you got started and how the journey has been so far. In looking back on my life, I realize that I love helping people look good and feel good and I really enjoyed learning new things. So I went to cosmetology school to study hairstyling. After getting my license, a relative was leaving the business and asked if I wanted to take it over. What a great opportunity! Of course, I said yes and most of the clients she had did stay with me. To further my skills, I took as many classes as I could. I made a friend at one of the classes and she asked if I wanted to take an anesthetic course. Well, she dropped out, and I liked it so much that I continued. Now with an esthetic license, I started doing facials at a makeup salon but continued with hairstyling for awhile along with the facials. Then when I worked in a spa, I quit the hair business and just did facials. After a few years, I met up with an old friend and together we opened our own skin care salon. She had to leave after a few years because of illness. I continued with the business, hiring estheticians and massage therapists. That was like babysitting and did not like that. So I decided to rent my other rooms. Esthetics led me to take many different courses throughout the years in other alternative modalities. I wanted to incorporate more treatments into my business. Massage therapy, aromatherapy, reflexology, energy healing modalities (Silva Method, Pranic Healing, Quantum Touch, Reiki, E.F.T., Psych-K, Sound Energy Therapy with Tuning Forks) are the ones I worked with for some time. Today I do sound energy therapy with tuning forks and facials but the facial treatments are different today. I not only follow the scientific rule, “The more you irritate the skin, the more it becomes inflamed, the faster you age, and the more you are prone to skin cancer” but I’ve incorporated the energy healing techniques into my facial treatments. This helps people to relax even more so they can not only look good but also feel great! And you could have a tuning forks treatment too, and float out of here. Before you leave I will recommend Pevonia products for you to take home to help keep your skin healthier and happier. Having your own business brings on challenges but having a partner brings on more challenges. Communication was the biggest part of the challenge. We both were used to doing things on our own and in our own way without consulting anyone. Because of past experiences in our lives, we knew how to handle the situations with talking thus working things out. Our friendship became stronger and we are still friends today. The partnership did end after only about 5 years because she became quite ill and needed to leave the business. It was a scary time. Would she be okay and would I be okay without her helping me in the business? Well, she was slowly getting better and is doing well today. I decided to hire other people to work for me since I had space to pay for. That was not working out as I had hoped. My next plan was to have independent contractors rent the spaces. That worked out much better. They all were responsible and easy to work with and really nice people, but nothing lasts forever. Everybody seemed to leave about the time the economy bottomed out, 2008 and I was left with all the bills for space. Hard times for me too. Business was just not the same anymore. I looked for a year for independent contractors to rent the space from me and finally, I had two women who did. Again I was lucky with two great women. In 2011, I decided it was time to move on. My daughters and grandchildren had moved from out of state to the St. Charles area and I wanted to be closer. So I moved myself and my business out to Geneva. It’s been difficult building the business back up out here. Marketing is a lot different the past few years doing it with social media. I had built up the business in Westmont with 99% referrals. I said I love learning and I have learned so much through my life and am still learning. All this has made me a stronger, empathetic, and a calm and peaceful woman. Skin Care Plus is located in Geneva, Il. The setting is quiet and peaceful with scents from a diffusor when you walk in. First-time clients are given a form to fill out. From there and the consultation that follows, the client and I can figure out what their skin needs at this time. At the end of the facial, I recommend Pevonia products to further help their skin which they can purchase from me. 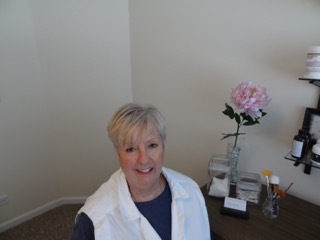 After many years of doing many different services, I now specialize in facial treatments, mainly for calming and antiaging, product consultations (recommending products for their face), and sound energy therapy using tuning forks. The tuning forks treatment is the one energy healing treatment that relaxed me so much that I dozed off. First time ever with any treatment, so I was sold on that one to do for clients. Even clients who talk a lot, stop talking when I do the tuning forks on them. The facial treatments that I do are not aggressive treatments in that I do not tear down the skin with peels and such. Been there, done that. I believe in helping to repair and build up the skin to make it look better and stay healthier. Peels and such make the skin thinner and more sensitive and in the long run, you will age faster. I always tell clients that before doing a facial for the first time. I do use glycolic or an alternative to a peel that is a more natural product for clients that need more. The scientific rule that I follow is “The more you irritate the skin, the more you become inflamed, the faster you age, and the more you are prone to skin cancer”. Different modalities are used during a facial, such as LED light therapy (anti-aging, healing, calming, helps acne, and more), Ultra High Frequency (helps acne, healing, helps scar, antiaging, and more), High Frequency (kills acne bacteria). Ultrasonic (helps product penetration). To help the skin repair even better and faster, healing energy modalities are used during the facial. A mini sound therapy treatment can be added to the facial for added relaxation. The Pevonia product I use and sell is safe, effective, and results oriented with the latest ingredients for all the skin’s needs. The ingredients are natural and organic. Being the oldest child, I was responsible, quiet, conscientious, curious, neat, serious. My Mom and Dad worked so I had to take care of my youngest sister. I cooked and cleaned. I was a serious person who had to do everything well. I couldn’t call my childhood as carefree. I was able to play baseball and ride my bike. In high school, I had a nice group of friends that I biked with and played tennis. I liked school and was an honor roll student. I obeyed the rules most of the time and if I didn’t, nobody knew it. My mom and dad were strict so you didn’t argue with them at all. The other day a client called to ask why the product she just purchased from me was much cheaper online. I explained to her about diverted product sold in “unauthorized places” and she did not know about this at all. Since it is a big problem for people like me and big companies, let me explain. When products are much lower in cost than at reputable places, they are known as diverted products. Buyer Beware. These products can be counterfeit, diluted and /or altered formulas, old or expired products that may not be safe to use. There could be completely different ingredients in the product than on the label. In fact there was an expose on a TV news program about Mac products that were sold in a shop in New York City. They had the products tested and found that they were not Mac’s ingredients and had aluminum and barium and other toxic ingredients in them. The packaging was Mac’s packaging. No difference at all. So people thought they were getting a Mac product at a great cheap price. That’s your red flag right there. You could be harming your body by using these products, as they can not only be ineffective but dangerous too, resulting in irritation, infection, rashes, blisters, swelling, or even worse. Diverted products may have been gathered from multiple places (a company’s dumpster for example) or stolen before being sold. They then put them on Amazon or Ebay for sale. The warehouses where they store them can be hot and humid or extremely cold, helping the product to lose its effectiveness and be a breeding ground for bacteria. Companies like Target, Walmart and drugstores have been known to sell diverted products also. Pevonia products are exclusively available through licensed and authorized industry professionals and Not available through mass market retailers. Diverted product hurts me, an independent business, the professional manufacturer and you, too, the consumer who trusts a professional brand to deliver the highest quality ingredients and results. When purchasing a diverted product , you are contributing to a major problem that affects you, the consumer, and the entire skincare industry. If you decide to still buy from an unauthorized seller, think of your health and safety. Would you purchase a medication online that is discounted to save a few dollars? Your skin is the largest organ of your body and protects you and your insides. Do you want to endanger its health with diverted products? Buy safe from an authorized seller. I’d be happy to answer any questions you have about this. This is not only a problem for the skin care industry but many others also. Professional facials are way beyond pampering. They are essential for repairing skin issues to keep the face looking younger. Normally your skin cells turnover approximately every 30 days but as we move on in life this process slows down which causes aging. Exposure to elements on a daily basis–sun, wind, cold, heat, pollution, stress, etc. also elicits more aging, sensitivity, dehydration, and more. Monthly facial treatments will assist to reverse this damage by repairing the skin’s barrier, adding moisture, reducing sensitivity, calming redness, firming and toning, reducing lines, wrinkles and even breakouts. The facial starts with a skin analysis, then a deep cleansing and extraction for clear, smooth skin. Next, based on your skin analysis, a massage and mask, LED light therapy or other modality for anti-aging or acne. My treatments include a neck/shoulder massage and head massage. I also incorporate energy healing modalities for further relaxation. The touch that you receive is proven to assist in strengthening your immune system and to reduce stress levels. This will allow a more youthful, healthier looking face and body. Your face is what people see first, so take care of it with a professional facial treatment NOW. Remember also that your home care routine is very important between facials to continue overall skincare improvement. I use the Pevonia product line. It is safe and effective in keeping your skin young and healthy. The LED light therapy facial is on special now through Oct. 21, 2017. LED light therapy helps with all skin conditions. Check out specials on this site. Clients ask me to check out their skin care products to see if they are safe and effective. I follow the Scientific Rule: The more you irritate the skin, the more it becomes inflamed, the faster you age and the more you are prone to skin cancer. By looking at the ingredient label, I am able to tell if they are safe or not but not really tell if they are effective. To check to see if the product is safe, I look to see what ingredients are irritants and possible or known carcinogens. One such ingredient, Triclosan, an antibacterial, was found to cause cancer in mice, so it is a possible carcinogenic for us. It can be found in skin care products, toothpastes, deodorant and more. This ingredient was questionable in the late 1990s and was taken out of the Pevonia products that I carry in less than a year. Yet many skin care companies still contain it. The products’ effectiveness can’t be told by the ingredients list. You really need to know your company and the testing they do. Two things that are important to know: the percentage of the active ingredients in the product and if there is a special delivery system to help the ingredients to do their work.The active ingredients such as peptides, stem cells, and vitamin C, etc. need to have a certain percentage in the product to be beneficial. Also an ingredient like vitamin C needs a special manufacturing process to be beneficial in your bottle and effective. It’s not easy for you tell if the product is going to be effective. That’s where your facial specialist comes in to help. I had researched many companies before I chose the Pevonia line. So according to your skin’s needs, I can let you know what products would help your skin to be healthier and younger looking. The more you irritate the skin, the more it becomes inflamed, the faster you age and the more you are prone to skin cancer. If you have questions about your products, just call me. I would be glad to help and recommend. Shopping for an anti-aging skin care products is a challenge. It can be difficult to know which skin care are best. These tips can help you shop with confidence. An anti-aging moisturizer helps to minimize fine lines. It is so effective that moisturizer is the secret ingredient in many anti-aging products. Using a moisturizer with sunscreen is fine. Just be sure that the product offers broad-spectrum coverage and an SPF of 30 or higher. If you will spend time outdoors during the day, you should apply a sunscreen that offers broad-spectrum protection, SPF 30 (or higher), and water resistance. Be sure to reapply your sunscreen every two hours while outdoors. Treat Your Top Skin Care Concern: Give sunscreen and moisturizer a few weeks to work. Then look at your skin. Is there still a sign of aging that bothers you? No product can treat all signs of skin aging. Using more than one anti-aging product in a few days or weeks can irritate the skin, making you look older. Buy Skin Care Products For Your Skin Type: Your sunscreen, moisturizer, and other anti-aging skin care products will work best if they are formulated for your skin type. If your skin tends to be oily, select a moisturizer made for oily skin. If you have sensitive skin, look for “sensitive skin” on the label. This is important because no one product works for everyone. Be sure to give products time to work. A moisturizer can plump up fine lines in a few days, but most products take at least 6 weeks to work. Sometimes it can take up to 3 months. Be patient and give the product time time to work. Be sure to continue using your skin care products, if you want to continue seeing results. People often stop using a skin care products once they see results. Even hypoallergenic products can cause a skin reaction, so test them before applying them to your face. Apply a small amount to your inner forearm. Repeat this twice a day for 4 to 5 days. If your skin looks normal — free of redness, itch, and other reactions — you can apply it to your face and other skin. Stop using skin care products that sting, burn, or tingle. These sensations mean that the product irritates your skin. Irritated skin looks older. If you are using a product prescribed by your dermatologist, ask if this should be happening before you stop using it. Some prescription-strength products will burn or sting. Some products contain active ingredients that can cause problems if you apply more than directed. You could end up with clogged pores, blotchy skin, or excessively dry skin. Read the instructions, and use as directed. Have Realistic Expectations: Exaggerated promises, such as look 10 years younger overnight or quickly reduces all signs of aging, are too good to be true. It’s important to remember that anti-aging skin care products deliver modest results. You cannot get the results of a facelift from a cream. “Clinically proven” means that the product was given to consumers to try. It does not mean the product underwent clinical trials and received approval from the U.S. Food and Drug Administration (FDA). Select Products Within Your Price Range: It’s human nature to think that the more expensive the product, the better the results. Effective anti-aging products come in all price ranges. Editor’s Note: The following article explains the difference between adding water to the skin (hydrating) and using a barrier on the skin (moisturizing). Toners are more for skin balancing and helping product to absorb better. They do have hydrating qualities depending on the ingredients but serums are the very best products for hydrating. Pevonia has safe and effective hydrating serums such as Timeless Repair Serum with caviar and pearl extract, Elastin Intensifier, and Collagen Intensifier. I keep getting inquiries as the difference between moisturizing and hydrating. It’s an interesting question since both words are often used interchangeably, and it would seem they are the same. But are they? Well, not really. You see hydrating products are formulated to increase water content to plump up the skin while moisturizing products keep the skin soft and pliable by preventing water content in the skin from evaporating. But I thought I’ll discuss a little more here and to begin, let’s look at what exactly is moisturizing and hydrating. Moisturizing makes skin soft and smooth. Moisturizing aims to form a barrier film on the skin’s surface to prevent moisture loss. This makes the skin feel softer and smoother. Moisturizers generally work in two ways with two types of ingredients. First, you have the humectants, such as hyaluronic acid, glycerin, sorbitol, propylene glycol, lactic acid, and colloidal oatmeal, which work by attracting water molecules to the skin. And second are emollients, like sweet almond oil, apricot oil, shea butter, and cocoa butter, which work by softening skin and forming a protective layer on top, to prevent water loss by coating the skin with an oil-based substance to trap moisture in. Generally, the drier your skin, the thicker the moisturizer you need as they can help banish dry patches, flakiness and even fine lines. And in theory, a moisturizer should protect your skin from water loss until you wash your face but we know this does not always happen for various reasons, one of which is environmental pollution. Hydrating makes skin plump and supple. The upper layers on the epidermis needs a supply of water to make sure they are kept plump and smooth. Hence, hydrating facial products are designed for this purpose to increase the water content of the skin. They usually contain occlusive agents that keep moisture from leaving the skin and humectants that attract more moisture to the skin. So in a sense, hydrating products are often said to be moisturizing as well. However, to me, hydrating means the actual replenishment of moisture or water to skin cells. Therefore, you should replenish moisture to your skin first before you have your moisturizing skincare products applied. Your skin needs to be hydrated and moisturized. Going by the structure of our skin, we need both hydrating and moisturizing products applied on our skin. However, does this necessarily mean you need to apply two different products? Well, not so because many moisturizers these days are designed to be water-based, containing mostly water-binding ingredients such as hyaluronic acid with some oil. But say if your skin is very dry, it would be better to use two products, such as a hydrating toner or hydrating serum followed by a richer moisturizer. Skincare Tip: Apply moisturizer to increase hydrating benefits. Personally, I only use a hydrating toner prior to using my facial oil and moisturizer. I always ensure that I apply the products while my skin is still damp. You might like to know that applying moisturizer to a damp face helps to lock in the water from the upper layers of the skin, and prevents evaporation. The moisturizer will also help seal the hydrating benefits from the toner deep into the skin. In the past, I’ve talked about skin cleansers and toners. Cleansers are probably the most important product to use on your skin. If they are too acidic or too alkaline, they tear down the skin, making it irritated and more sensitive. Scrubs can cause the same type of skin damage. The more you irritate the skin, the more it becomes inflamed, the faster you age and the more you are prone to skin cancer. Step #2 is skin toner. Toners balance the skin and they also remove tap residue. Depending on your water supply, this residue can cause breakout and problems on the skin. On to the third step in your home care routine which is a serum, (also called intensifiers, concentrates, elixirs, and boosters). Clients ask me if they really need a serum. The answer is YES. The appropriate serum can make a dramatic difference on your face. It can make your skin look and feel younger, help tighten pores, calm redness, hydrate, diminish wrinkles, help acne, lighten, and more. The best thing about specialized serums, is that they have powerful, concentrated, active ingredients that absorb quickly to deliver these ingredients. The gel-like product is usually water based so it doesn’t clog your pores. When you want to target specific skin concerns, serums are the way to go. Not only do they offer targeted results, but they strengthen your cells and give them nourishment and help repair. The one serum I like best, especially in the sun, is Vitamin C Concentrate by Pevonia. It helps prevent and repair sun damage. These concentrates need to go on immediately after cleansing and toning. The skin needs to be very moist for the serum to be massaged gently (up and out movements) into the skin of the face, neck, and upper chest. If you don’t have toner, then leave your face moist with water (distilled water if possible). A creamy lotion or cream moisturizer over the top is usually recommended to keep serum from evaporating before it delivers its targeted ingredient. Whatever your skin care concerns are, you can see faster results using the appropriate serum. Not all serums are created equal since manufacturing practices vary from brand to brand. Pevonia has my serums of choice because they are safe and effective. An outright ban on the common use of tiny plastic beads from products that enter wastewater is the best way to protect water quality, wildlife, and resources used by people, a group of conservation scientists suggest in a new analysis. It also can help protect your skin and overall health. These microbeads are one part of the microplastic problem in oceans, freshwater lakes and rivers, but are a special concern because in many products they are literally designed to be flushed down the drain. And even at conservative estimates, the collective total of microbeads being produced today is enormous. In an article just published in the journal Environmental Science and Technology, scientists from seven institutions say that nontoxic and biodegradable alternatives exist for microbeads, which are used in hundreds of products as abrasive scrubbers, ranging from face washes, exfoliants to toothpaste. Around the size of a grain of sand, they can provide a gritty texture to products where that is needed. “We’re facing a plastic crisis and don’t even know it,” said Stephanie Green, the David H. Smith Conservation Research Fellow in the College of Science at Oregon State University, and co-author of this report. In this analysis, and using extremely conservative methodology, the researchers estimated that 8 trillion microbeads per day are being emitted into aquatic habitats in the United States – enough to cover more than 300 tennis courts a day. But the other 99 percent of the microbeads – another 800 trillion – end up in sludge from sewage plants, which is often spread over areas of land. Many of those microbeads can then make their way into streams and oceans through runoff. “Microbeads are just one of many types of microplastic found in aquatic habitats and in the gut content of wildlife,” said Chelsea Rochman, the David H. Smith Conservation Research Postdoctoral Fellow at the University of California/Davis, and lead author on the analysis. Even though microbeads are just one part of the larger concern about plastic debris that end up in oceans and other aquatic habitat, they are also one of the most controllable. With growing awareness of this problem, a number of companies have committed to stop using microbeads in their cosmetics, shampoos, toothpastes and skin care products, and several states have already regulated or banned the products. The researchers point out in their analysis, however, that some bans have included loopholes using strategic wording. Many microbeads are used in personal care products that are not “rinse off,” such as deodorants and cleaners. And some regulations use the term “biodegradable” to specify what products are allowed – but some microbeads can biodegrade just slightly, which may allow their continued use. If legislation is sought, “new wording should ensure that a material that is persistent, bioaccumulative, or toxic is not added to products designed to go down the drain,” the researchers wrote in their report. “The probability of risk from microbead pollution is high, while the solution to this problem is simple,” they concluded.